Pure Digital Technologies Inc was kind enough to send us a review unit of The Flip Mino HD, “The world’s smallest HD camcorder”. To prepare for this review, we tested out the pocket-sized Flip Mino HD over the last few months. Pure Digital has revolutionized the home video camcorder market by creating simple to operate, compact digital camcorders that anyone can use. Over 1 million Flip camcorders have been sold so far and the number grows monthly. Before we dig into the review, let’s take a look at the product details found on the manufacturers website. Next, we take a look at what’s inside the box. The Flip Mino HD comes delivered in a sleek box packaging that includes the Flip Mino HD itself, a lanyard strap, a carrying bag that doubles as a lens cloth, a quick start guide, a warranty insert and a set of standard yellow/red/white audio/video cables for connecting to a TV. 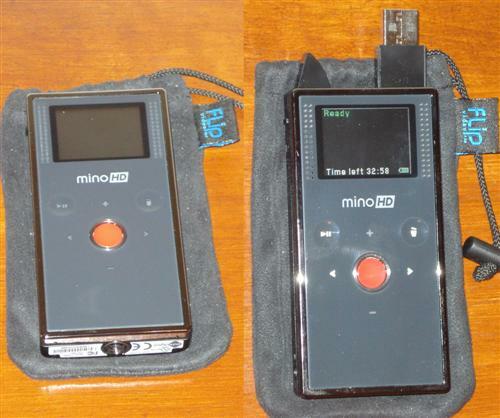 Below are two different photos of the Flip Mino itself, with its signature flip out USB plug protruding from the top right of the device in the image on the right. The Flip camcorders get their name from this built in USB plug, which flips out after you hit a switch on the top left side of the device. For the videos embedded in this review, we used video recorded at two different locations. The first was outdoors, at the Matsuri Festival of Japan, at Heritage park in downtown Phoenix, AZ. The second was indoors, at the Twestival Phoenix, which took place at the Half Moon Sports Grill in Phoenix. These videos can help you get a glimpse into the audio and video quality of the Flip Mino HD camcorder. Please take note that the Vimeo web service compresses the video, so the source video files are actually an even higher quality. Drawing from our experience with the Flip Mino HD over the last few months, we would like to wrap this review up with our list of positives, negatives and some final thoughts. The Flip Mino HD camcorder has quickly become one of our favorite gadgets. Due to the compact size, it is easy to take the Flip along with you just about anywhere you go. Just drop it in your pocket and pop it out when you’re ready to capture some video. The audio & video quality are very good, vastly superior to similar compact HD camcorders made by Aiptek (we also own an Aiptek A-HD). The few negatives that we found with the Flip Mino HD are far outweighed by its positives and its low price. The Flip Mino HD is perfect for the casual video maker, the video blogger or anyone else looking for a compact, highly portable camcorder. We can easily give the Flip Mino HD our recommendation. 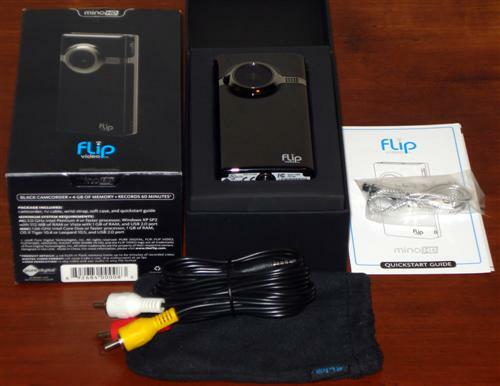 At the time of this review, the Flip Mino HD can be purchased for $209 at Amazon or straight from the manufacturer at TheFlip.com. If you’re looking for more Flip action, we also recently reviewed the Flip Mino camcorder (non-HD version). I have the Flip HD and I’m having a hard time burning to a DVD. Does it require HD DVD’s or can any old blank DVD work? You can burn Flip Mino HD video files to DVD’s as a DVD data disc. In order to make a DVD that is compliant with most standalone DVD players you have to have a program that converts the video into a DVD Video compliant format (.VOB files). The included FlipShare program can create DVD’s, but I haven’t tested it thus far. In the FlipShare program, click on the “Create” Drop Down menu and then choose DVD. Thanks. There cams out there that have these programs with the cam. Anyway just saying it’s an extra cost if you want this. Is it better – costs and quality – to buy one that already has these capabilities? I like having the videos on dvd! That seems to be a huge negative! I’ll update the review with that in the negatives list. Due to this, you’d have to find a program that can author MP4 files into DVD video format. Most of these authoring programs have DVD burning built in. If you’re using Windows XP, you can try Windows Movie Maker. Windows Vista or Windows 7, try Windows Live Movie Maker. For Mac, try iMovie. If those don’t work, you’ll have to find a 3rd party app like the Nero suite that can author DVD’s from MP4 files.